Presently, synchronous ties (AC lines) interconnect all networks in the eastern U.S. and Canada. Synchronous ties also (AC lines) interconnect all networks in the western U.S. and Canada. Several nonsynchronous ties (DC lines) connect the East and the West. These interconnections increase the reliability of the electric supply systems. In the U.S., the nominal voltage of the high-voltage lines is between 100 kV and 230 kV. The voltage of the extra-high-voltage lines is above 230 kV and below 800 kV. The voltage of an ultra-high-voltage line is above 800 kV. The maximum length of high-voltage lines is around 200 miles. Extra-high-voltage transmission lines generally supply energy up to 400–500 miles without intermediate switching and var support. Transmission lines are terminated at the bus of a substation. 1. 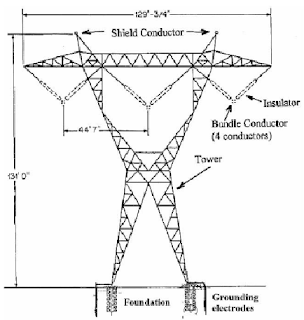 Tower: The figure shows a lattice, steel tower. 2. Insulator: V strings hold four bundled conductors in each phase. 3. Conductor: Each conductor is stranded, steel reinforced aluminum cable. 4. Foundation and grounding: Steel-reinforced concrete foundation and grounding electrodes placed in the ground. 5. Shield conductors: Two grounded shield conductors protect the phase conductors from lightning. At lower voltages the appearance of lines can be improved by using more aesthetically pleasing steel tubular towers. Steel tubular towers are made out of a tapered steel tube equipped with banded arms. The arms hold the insulators and the conductors. Figure 4.6 shows typical 230-kV steel tubular and lattice double-circuit towers.